A Contractor's dream come true... pop open this rolling tool cart and experience a delicious break time snack. Huge sale right now on chocolate miniature mechanics tool box filled with delicious chocolate tools and chocolate chip cookies themed for your industry. 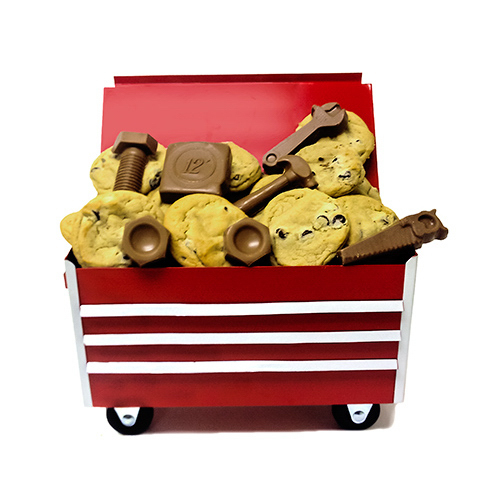 Check out our Sweet Deals On Wheels, our larger tool cart and also our Cookie & Themed Chocolate Rolling Tool Box and our All Chocolate Tool Box With Themed Chocolate. Don’t miss out on our huge sale today offering great savings just in time for holiday gifts! The Gift Planner wants to be your personal gift planner! Additional savings on bulk orders. 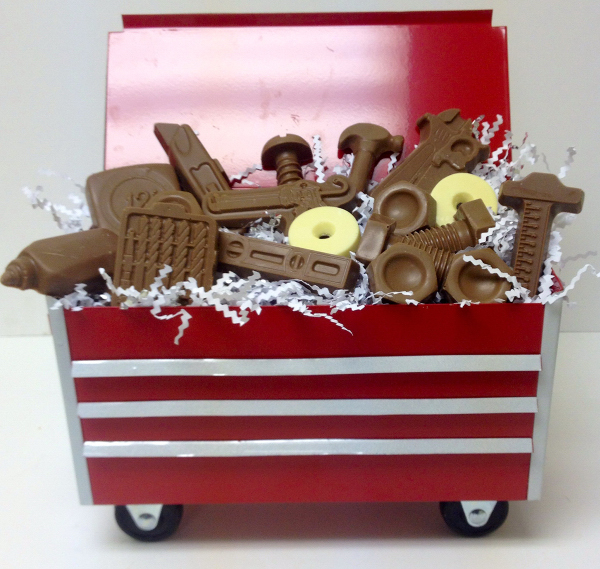 Make any job sweet with our unique sweet deals on wheels miniature rolling tool box! Our unique custom made sweet deals on wheels measure 12″ X 6.5″ X 6″ and comes with real rolling 1-1/2″ rubber wheels. Comes in the classic red with full length chrome-look handles and rubber grooved mat. The top and front lifts up and back to reveal a large open storage space. There are two felt lined shelves for added display and storage. The 1″ tall, full length bottom drawer pulls out for additional storage. Packed full with delicious cookies and milk chocolate themed tools. Other delicious gourmet treats available upon request! Themed chocolate tools of the trade in custom adorable miniature rolling tool box! This adorable miniature all chocolate tool box with themed chocolate is a Contractor’s dream come true!!! These custom gifts are perfect for any construction, contractor company for thank you gifts, holiday gifts and more. Pop open this rolling tool box and experience a delicious break time snack. Truly a unique desktop tool box. Each box is constructed with .24 gauge steel, powder coated in red, has a rubber mat, and is felt lined. Themed milk Chocolate tools available perfect for your company and customize this gift with your logo. 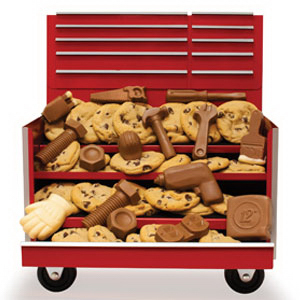 A Contractor’s dream come true… pop open this rolling tool cart and experience a delicious break time snack. This adorable miniature cookie & themed chocolate rolling tool box is a Contractor’s dream come true!!! These custom gifts are perfect for any construction, contractor company for thank you gifts, holiday gifts and more. Pop open this rolling tool box and experience a delicious break time snack. Truly a unique desktop tool box. Each box is constructed with .24 gauge steel, powder coated in red, has a rubber mat, and is felt lined. Themed milk Chocolate tools available perfect for your company and customize this gift with your logo.